Ah…Pasta! Seems I can never have noodles often enough. Sometimes I’ll mix zucchini noodles in with it. Sometimes long skinny angel hair sounds best, other times ziti or rigatoni. Anyway you serve it, it’s a favorite choice. That being the case, it is a continual challenge finding ways to lighten up the topping I serve with it. As you see in this recipe. Spinach is a must, along with chopped onion. This time I tossed in some chicken for the protein and the taste. And a terrific taste it had. One of the best things about a dish like this is the versatility. You can add in any vegetables you like. Mushrooms are another favorite, sometimes peppers. Leave the chicken out and you have a tasty vegetarian dish. Or add some tofu. It’s delicious with ground turkey or ground beef if you prefer. Season with soy sauce if you would like an Asian twist to the dish. It only takes minutes to fix. Serve it hot with fresh fruit or a little salad. It’s so tasty. 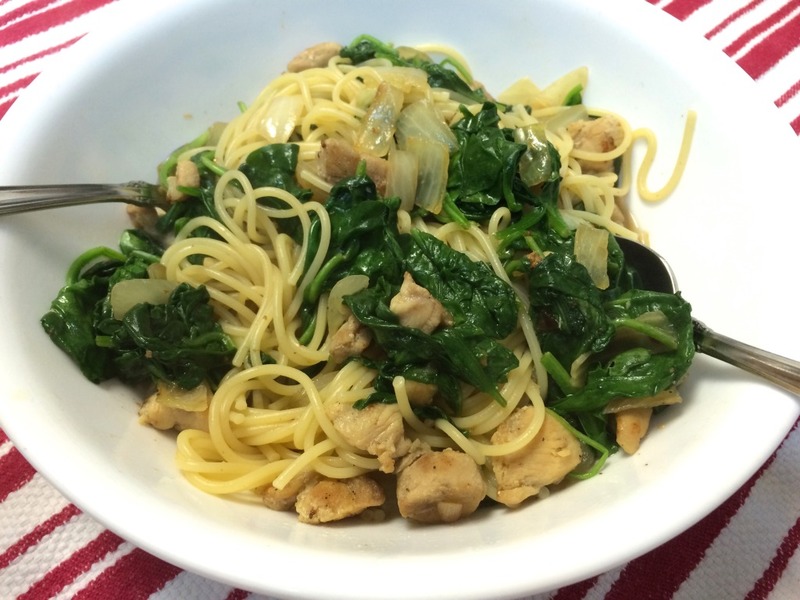 Chicken, spinach, and pasta for a fast, flavorful pasta dish sure to satisfy. Cook pasta, al dente, according to package directions, then drain. In a large skillet, saute garlic and onion in hot oil for 3 to 4 minutes. Add chicken breast, and season with salt and pepper. Saute until no longer pink, stirring frequently. Don't overcook. Cover and cook down over medium heat for 4 or 5 minutes. Toss frequently so spinach cooks down evenly. Add pasta, a bit at a time, tossing and blending with other ingredients. If necessary you can add a little more oil or broth. Thanks Cheryl, it is so good that way too. Mushrooms are so good with it too. The spinach is perfect in it, but then I like spinach in almost everything. I hope you try it. Sounds good, though I would make it without the chicken, and would opt for the vegetable broth. 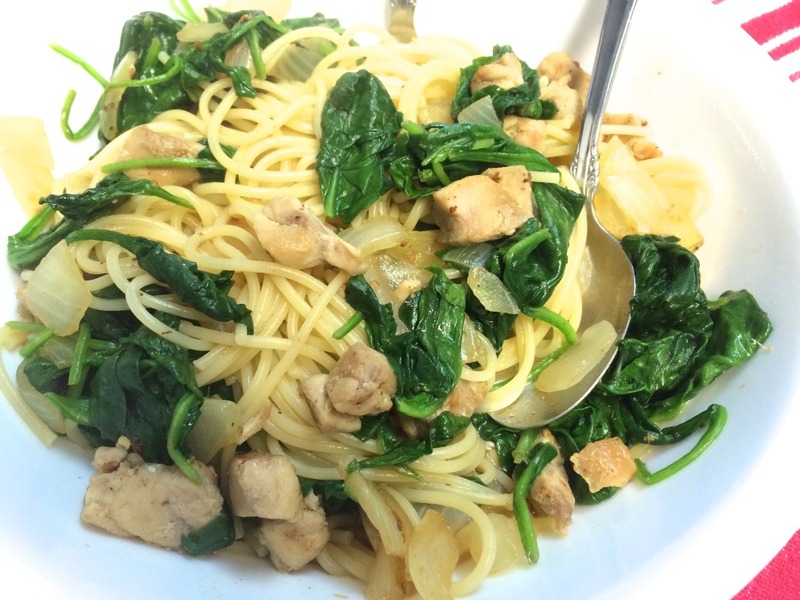 We’ve made this type of dish with mushrooms before, but I do like the idea of adding spinach to it. Thanks.